ofis here again next to RockAuto to offer us a cool $100 rebate for purchases of performance exhaust systems. Isn`t this great? DynoMax is considered a leading company in terms of exhaust systems, no matter if we are talking about axle-back systems, stainless steel exhaust systems, cat-back systems or stainless steel muffler technology. Note: Each item has the company`s theme: “Pure Unadulterated POWER” and is also backed by a ninety-day Performance & Sound Guarantee and limited lifetime warranty. Note: The rebate is valid only between 01.09.16 and 31.10.16. This rebate doesn`t include any labor or installation expenses. The rebate is only valid for the above DynoMax qualifying products. You need to submit the original date register receipt (copy & original) along with business name and physical address. The receipt needs to verify the order date as well as that the order is paid in full. You need to complete this form. You can submit your order info online as well at: http://offers.tenneco.com. The deal submission needs to be postmarked by 30.11.16. The company isn`t responsible for any lost or late mail. The deal is only valid in Puerto Rico and the U.S. This rebate is an end customer deal. This rebate cannot be mixed with any other Tenneco discount or deal. Did you know that RockAuto isn`t the only reliable online auto retailer out there? Napa Auto Parts, or National Automotive Parts Association (NAPA), can also be a trustworthy option for all customers. This company was found in 1925 and is one of the most popular retailers of auto parts, service products and accessories in North America. NAPA has more than 6.000 stores opened all over the U.S., 1.110 of them being owned by Genuine Parts Company, while the others are independently owned. Around fifteen thousand NAPA Auto Care service facilities are mostly in operation for repair or maintenance services. Besides the U.S., this brand also has locations in Canada through United Auto Parts, which is a small division of Genuine Parts Company, but it also operates through NAPA Auto facilities that offers repair services in Mexico as well as other various facilities throughout Latin America and the Caribbean. Three years ago, Genuine Parts Company has taken over Exego Group, one of the leading distributors of auto parts and accessories in Australasia. This company carries auto replacement parts, auto accessories, paint supplies, equipment and tools, marine supplies as well as heavy duty parts. The brand operates a company which deals with parts repackaging which is known as Balkamp. You can begin doing the same thing you are doing, only a bit different – shopping at Napa by using Napa Rewards. You`ll receive 1 point for each $1 you spend after signing up at any participating location. After gathering 100 points, you will get $5 off for your next NAPA order. It doesn`t get any easier than this! You can also pay with cash. However, you`ll need to let the counterperson be aware that you are already a member of the program or you would want to join NAPA Rewards. When using NAPA Rewards, you don`t need to worry about any hassle. The program is completely digital, so you are able to track your rewards as well as verify your statement on the internet. There`s no paper statements to use, and you don`t also need to flip through the wallet for your credit card. Just getting rewards for the fact that you are shopping for discount auto parts. How the process works? At the moment, only certain stores take part in NAPA Rewards. If you are interested in having your store included in this program, contact the company here. Unlike Carquest or Pep Boys, NAPA offers rebates and monthly specials. Not even AutoZone or O`Reilly Auto Parts offers rebates. The only other auto retailer that offers them is RockAuto. Visit http://naparebates.com/, find a rebate, submit your rebate or track it – it`s that easy! Each promotional deal has specific date ranges in which customers are able to order and then submit their info to be eligible for the rebate. If you won`t be able to make your order within the specified dates, you won`t be eligible for the rebate. All the info requested on the Official Rebate Claim form need to be completed. You shouldn`t let any black or empty spaces in the form. In addition, the company may request to verify your order. The completed claim form along with any other requirements needs to be mailed to the actual address that is listed in the form. You should be certain you offer the right postage for the mailing, especially if you`ll mail to an address outside your country. If you need to find the nearest NAPA store, just add your location below and hit the Search button. If you are enthusiastic about driving your car, than you most definitely need a way to cut the expenses for your auto parts. Using an AutoZone discount can be one option. But to be able to use this form of promotional deal, you first need to understand its basics. It`s required for everyone to understand that this is not in any way related to an AutoZone employee discount because it has everything to do with customers and not employees. On the other hand, an AutoZone discount sprint is that type of discount that is giving by the company to its employees. This way, if you work for this brand, you can get up to 25% off just by using this discount. If you want to apply for such a discount, you can find more info on the Sprint Discount Request page. In addition, there`s also a different type of promotional deal that is in the form of a AutoZone discount card, which customers can use to make their orders. When they use this card, a specific amount of money depending on the offer is deducted from the entire order. This type of promotion deal is one of the most popular ones released by the brand. Having more than 5,000 stores, the company was almost obligated to offer different types of an AutoZone discount in store. This is how discounts for different categories of customers were created, such as the AutoZone military discount, which was only available for military personnel. Additionally, the brand has also released various types of discounts for specific products, like the AutoZone battery discount, which was only available for customers who wanted to buy batteries. So, what`s your opinion about this? Are you going to be one of the company`s new customers that decide to use an AutoZone discount? If yes, you need to not wait no more and take action right away. Or you are going to miss big time. SolarGuard Reflective Sunshade Wholesales Closeout! Do you want to keep your car, SUV or truck cooler for the rest of the summer? If yes, then you`ll be happy to know that RockAuto can provide a SolarGuard Reflective sunshade windshield cover for all interested customers. 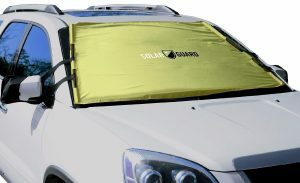 Now by using SolarGuard`s products you can forget about the original retail or wholesale prices and get these premium sunshade windshield covers at less than $4. What these covers do is fasten to the outside of the windshields and block the rays of the sun before entering the car. The most beautiful part of all this is that heat won`t build up next to your windshield and the dash as well as the electronics located behind your dash will remain cooler. Are you a person who is used to travel a lot? Then you maybe are used to leaving your car at the airport, but not always find enough time to install a car cover or the space to haul. With SolarGuard these issues stop right here because it offers a car cover level protection for the windshield in 2 different sizes. The covers can be attached in a matter of seconds using a strap that is adjustable along with a rail system so you can be sure you`ll get an optimal fit for your car or SUV. Just as with any other Wholesales Closeout, quantities may be limited. Use the “Tools & Universal Parts” tab to find your very own SolarGuard Reflective sunshade windshield cover, and then access the “Window” category next to the “Accessories” tab from the RockAuto catalog web page. In addition, if you feel you cannot manage to find the above guidelines, simply click here!. The new partnership between RockAuto and FRAM brings us a new rebate in which customers can get $4 back via mail. FRAM is a company launched over 75 years ago that deals with high quality air and oil filters for just about any vehicle out there. Users can visit the official site of the company and use the interactive displays or catalog to find a product that is suitable to their needs. Practically, to be eligible for this rebate you need to buy 1 FRAM air filter and 1 FRAM oil filter of your choosing and you`ll immediately be able to get 4$ back via mail. How to Qualify of the Rebate? You can get a form from www.fram.com or by clicking the image below. 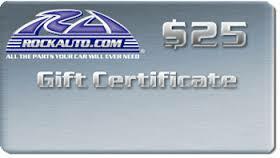 Did you know that RockAuto is one of the only auto retailers who release gift certificates for its customers? Also known as gift cards, these gift certificates make the ideal gift for any of your friends that you know to be car enthusiasts. They are not only easy to use, but also easy to purchase. In a few seconds you`ll have a wonderful gift to offer without even needing to leave your room. Each gift card has a code assigned which can be used when making an order. How to Order a RockAuto Gift Card? Denominations & Format – The very first thing you need to do is choose the denominations of your new gift card. You have options from $25 to $100, or you can go with the custom amount option if you should desire so. Then, you need to choose the format in which your gift certificate will be send. Shopping Cart – The next steps is to add your new gift card to the shopping card to proceed further. Adjusting Quantity – At this point, you have to adjust the quantity of your gift cards you want to buy. For the Custom Amount option, you just need to add the denomination it will interest you in the “Price” section. Billing & Ship to Details – Add your info in the Billing field and the email address of the person you are offering your gift in the Shipping field. Setting Shipping Option – For e-gift cards, choose email as shipping option. For plastic gift cards, choose any different shipping option. Choose Payment Option – Follow the guidelines and add your method of payment. Finalize Your Order – Click the “Place Order” button and finalize your purchase. When your order is validated, you`ll receive a confirmation email and the gift certificate will be sent as you indicated according to the shipping option chosen.